Slated for release in 2020, the Puma Fi features a tiny motor, which powers a cable system that 'laces' the training shoe. Step aside, Nike. Puma on Thursday unveiled its own self-lacing sneaker to compete with the Adapt BB Nike introduced last month. Slated for release in 2020, the Puma Fi features a tiny motor, which powers a cable system that "laces" the training shoe when you swipe a touch module on the tongue, Puma said in a news release. And that's not its only trick. 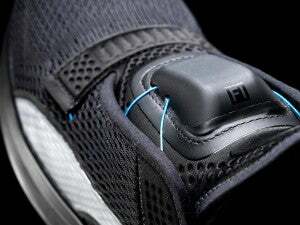 "It comes with a smart sensing capability that learns the shape of the foot of each user and adapts the fit of the shoe to the individual," Puma wrote. "Athletes can also monitor, adjust, and finetune fit through a smartphone app. To make things even more athlete-friendly, users can make on-the-fly adjustments with their Apple Watch$699.99 at Apple Store." Check out the video below for a peek at the Puma Fi. Puma is now seeking "tech-savvy" volunteers to beta test the upcoming shoe and provide feedback about its design, usability, and engineering. Interested individuals can sign up for the Fi beta test program via Puma's Pumatrac app, which is available for iOS and Android. According to Engadget, the Fi will be priced at $330 when it arrives next year, undercutting Nike's $350 Adapt BB. Fi isn't the only high-tech Puma shoe to get excited about. The company recently revived a computerized running shoe it first released in 1986 called the RS-Computer, updating it with Bluetooth support and a dedicated app. Getting your hands on the new RS-Computer might be a challenge, however: Puma only plans to release 86 globally, honoring the year they were first released.